At left is an example of the way this archive displays texts, including hundreds of newspaper articles from 1830 to 1930. While one of our aims was to preserve something like an article's original look, we developed this design mainly to make texts readable while taking as much advantage as possible of the capabilities of the electronic technology. 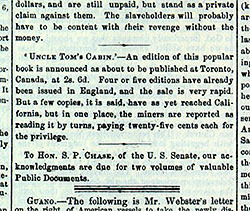 If you'd read this story about gold miners in California paying a quarter for a chance to read Uncle Tom's Cabin in the 19 August 1852 issue of the National Anti-Slavery Standard, or come across it while doing research in a collection that preserved that issue, you'd know that not only did the text look different than our digital transcription of it (see below left); it also was embedded in the larger context created by all the other articles around it. We hope that what is gained by using electronic technology to give modern users access to the past speaks for itself throughout this site, but we know it's crucial to realize what is changed or even lost when the past is studied through the window of a computer monitor. 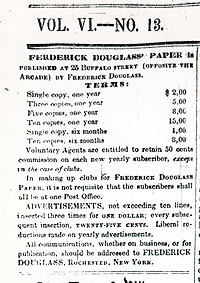 That's the goal of this exhibit, which allows you to read through the entire 18 March 1853 issue of Frederick Douglass' Paper. Of course, this is only one issue of one paper from one journalistic era in the 100-year period covered by this site. A southern newspaper from the same date, for example, would have contained different kinds of articles; any American newspaper from 1890, say, or 1920, would have looked very different. But at least by looking through this complete issue, you'll have a clearer sense of what the individual pieces in this archive can't give you. Most of the papers in which they were published are available in microfilm -- the "advanced technology" of an earlier generation, and a good place to look next if you want to read any of the articles in their larger textual and historical context. 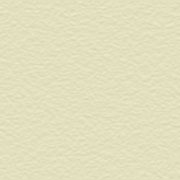 Otherwise, these links will take you page-by-page through the entire issue.